If you follow InTheSnow’s social channels (if you don’t, you really should) you will have noticed that we have recently been out at ISPO Munich, an international sports trade fair. It’s one of our first chances to see what’s new for the 2019/20 ski season from all our favourite brands and a chance for us to bring you a first look at what’s going to be trending next year. Firstly, a lot of you will probably be wondering what on earth ISPO Munich is. Well, it’s essentially a huge sports trade fair that takes place each year in (you guessed it) Munich, Germany. With a huge number of brands, manufacturers and consumer representatives attending. It’s often the first opportunity to take a look at the key products and developments for next season so is a great opportunity for us to get a sneak peek at the key trends for the coming winter. One thing is for sure, ISPO never fails to deliver. So, what were we most impressed by this year? A huge amount of innovation has been underway in the action sports industries lately, with technology from brands such as Arc’teryx and Patagonia always pushing the boundaries of construction and design. Our first stop at ISPO this year was The North Face stand, where a super secretive and highly anticipated introduction of an apparently revolutionary new product. With a fascinating presentation and a sprinkling of North Face drama, we discovered FUTURELIGHT. Branded ‘the world’s most advanced breathable-waterproof outerwear technology’, The North Face have created a whole new outerwear experience. They claim FUTURELIGHT will redefine the future of technical outerwear and drastically change how skiers and snowboarders experience waterproof performance. Indeed, it does seem pretty impressive, if the below video (demonstrating the breathability of Futurelight fabric vs. a competitor) is anything to go on. 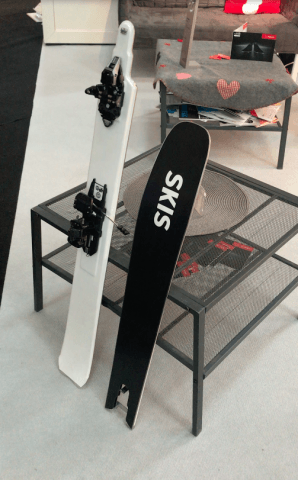 We also can’t fail to mention something we spotted in the ISPO Brandnew Awards section; the Split Ski. Now I don’t know about you, but this ski is unlike anything I’ve ever seen before. It was designed initially for paratroopers, to make it easier to parachute with skis (! ), as the ski can be easily taken apart into two, making it easier to carry. Of course, many would assume this means a significant effect on performance, but the Split Ski claims to make no compromises when it comes to on slope ability. Another item we spotted in the Brandnew section which could bring significant innovation to mountain safety was the Powderbee drone from Bluebird Mountain. An avalanche rescue drone, the Powderbee searches for transceiver signals above the avalanche zone, indicating the victim’s location and providing rescuers a much more manageable sized area for a manual search. Indeed, Bluebird Mountain’s mission statement is “Find and Rescue!” instead of “Search and Rescue(?)”. Small and lightweight, the Powderbee fits easily into a skier’s backpack and is simple to use and definitely an interesting development for off piste safety. Of course, sustainability is something many brands have been striving towards for years, but it felt that it really was a key theme this year. With one of the most creative stands we’ve seen at ISPO in a few years, Picture Organic Clothing firmly cemented their place at the forefront of sustainable development with a brand new partially bio-based membrane, featured in next season’s Harvest jacket. This jacket is made using 50% Recycled polyester and 42% Polyester and features the new membrane, Pebax Renew®, partially bio based, renewable technology. 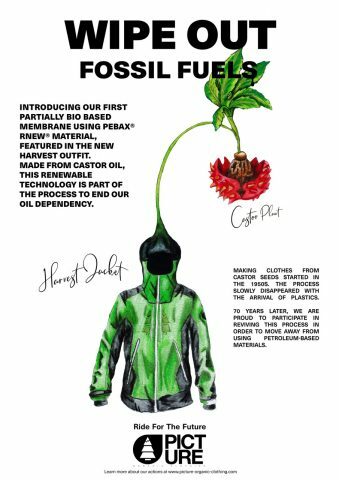 An alternative to petroleum-made synthetic fibres, Pebax Renew is made using castor oil and is part of Picture’s process to end oil dependency. Using castor seeds to make clothing is not an all new idea though; castor oil was used in clothes manufacturing back in the 1950s, before the introduction of plastics. 70 years later, Picture Organic Clothing are reviving this process in order to move away from using petroleum-based materials. The new Harvest jacket looks great and does not in any way compromise on quality, with 20k waterproof and breathability. Quality, style and sustainability? Sounds great to us! However, it’s not just Picture Organic Clothing which are striving to make their products as sustainable as possible next season. At ISPO, Patagonia also expressed their plans to manufacture all of their 62 shell jackets using 100% recycled materials, pretty impressive! 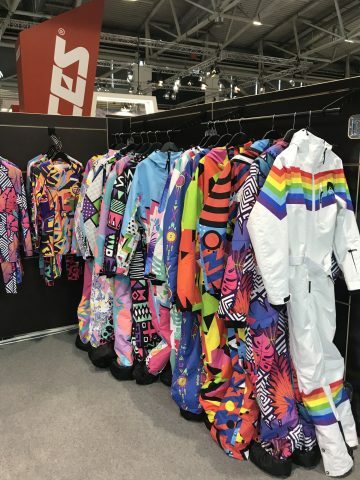 In terms of trends, one key theme we kept seeing at ISPO was the return of retro style, but in a much more subtle way to years gone by, where 80s shapes and neon colours were all the rage. This year we saw a variety of subtle retro styles, particularly on Goggle brands, with Giro and Dragon leading the way here. 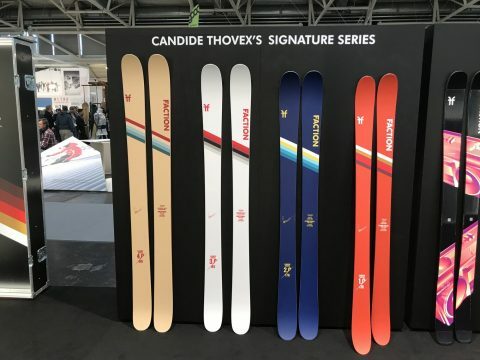 Even the new Candide Thovex Signature Series from Faction skis have a subtle vintage edge to their topsheet this year. 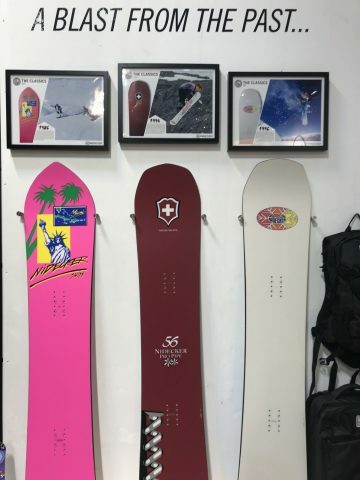 We also loved these vintage snowboards on display from Nidecker, reworkings of famous previous styles. Similarly, for outdoor brand Sprayway, the retro centrepiece of next season’s collection has a real history, being a reworking of a jacket which had been a popular bestseller back in the day. New technology and quality has been worked into this classic style with the result being a great-looking, highly technical piece. For those who like their retro pieces less subtle, one of our favourite spots this year at ISPO was Oosc, a British snow-wear brand with a huge personality. They started out creating retro style one-piece ski suits after realising that there were only a few ways to purchase these. Since starting out, their suits have boomed in popularity and the brand now even have their own pop-up shop at the Folie Douce in Meribel. They’ve also branched out into more casual attire, with ranges of stylish jackets and ski pants in striking bright colours that are sure to attract the best type of attention on the slopes. We also came across some fantastic children’s products which are sure to bring young skiers extra entertainment on the slopes next season. 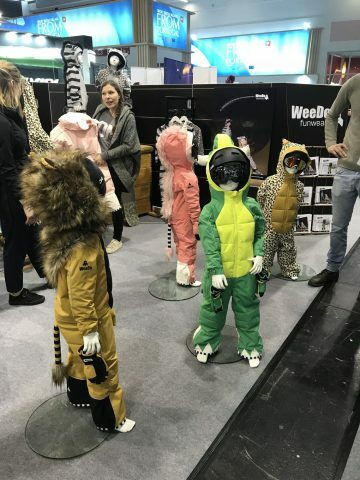 WeeDo Funwear create super cute snow suits with fun characters that caught our eye immediately. With fluffy manes, unicorn horns and dinosaur tails, these snow suits are not messing about. Plus, good insulation and waterproofing makes them perfect for all winter conditions, whether you’re skiing or building a snowman. 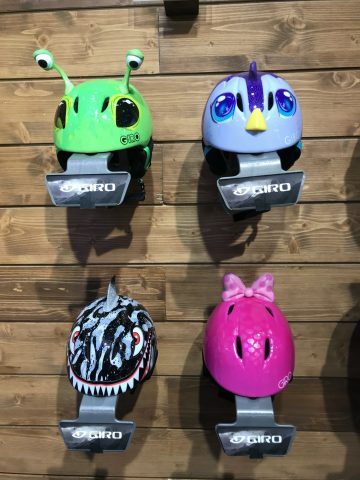 Meanwhile, Giro’s new range of children’s helmets provide the perfect way to ensure your child wears their protective headgear on the slopes. A range of fun styles, from a Minnie Mouse style pink, to a toothy shark (or Baby Shark if you will…) provide the cutest way to keep your child happy and will make it incredibly easy to spot them at the ski school meeting point! Of course, we viewed a huge range of interesting new products at ISPO, from skis to helmets and goggles to tech, of which we will be uploading full video reviews. So, make sure to keep your eyes peeled on our Youtube channel, Facebook page and our gear review pages to be the first to see all the new kit for 2019/20.